Juglans regia is the spice of trees, belonging to the sort Nut from the family of Juglandaceae. In a wild form these trees grow in Greece, Transcaucasia, China, India, Iran, Asia Minor. For the purpose of receiving fruits the walnut is grown up in Ukraine, Moldova, China, France, the USA, Turkey, Iran. 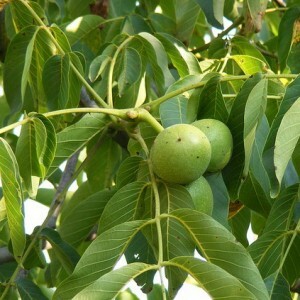 There are also such names of this species of trees as a walnut, an imperial nut, the Greek nut, mahogany. And in Ancient Greece fruits of this tree were called "acorns of gods" or "food for mind". The root system of a walnut powerful and deeply gets into the soil. The tree trunk covered with bark of gray color in height can reach 30 m. Leaves consist of 4-8 couples oval leaflets. Flowers are small, with a greenish shade. Blossoming can be observed in the spring. The most valuable part of a tree is the fruit kernel which has a form, reminding a human brain. Walnut. Walnut variety. Walnut cultivation.